10 points: Read a book that was written before you were born. 10 points: Read a book from the children’s section of a library or bookstore. The Mysterious Woods of Whistle Root by Christopher Pennell (Age range: 8-10 or 9-12, depending on where you look) – 215 pages. My review on this isn’t up yet, but it will be soon. I wish this book had been around when I was a child. I would have loved it right around the time I was into the Enchanted Wood books. I still enjoyed it as an adult, but chuld me definitely missed out! 20 points: Read a book with “son(s),” “daughter(s),” or “child(ren)” in the title. The Murderer’s Daughters by Randy Susan Meyers – 307 pages. I wanted to love this book, but in the end it was just okay. It started off well, but once the two girls were grown ups I lost interest. I felt like the author understood children’s emotions and struggles perfectly but then wasn’t really sure what to do with her characters once they became adults. Neither of them ever seemed to move forward or develop in any way (despite one of them getting married and having children!). Disappointing, especially considering I’d had it on my to-read list for years. The Internet tells me that A Long Way Down by Nick Hornby – 256 pages. This was another one that I wanted to like but just couldn’t. I should have felt sorry for the characters, but most of them just annoyed me. Click the book title for my full review. The Death of Bees by Lisa O’Donnell – 309 pages and Birthmarked by Caragh M. O’Brien – 360 pages (antonyms: Death and Birth). I loved The Death of Bees and wil be looking out for more books by this author. Birthmarked started off brilliantly then became a bit meh, but I liked it enough that I will considerbuying book 2 in the series to find out what happened next. Again, you can click on the book titles for my full reviews. So that’s 90 points so far. Up to now, I’ve pretty much stuck to the books I’d originally chosen (well, Birthmarked wasn’t on the original list… I chose it because it was the first vaguely interesting book I saw with “birth” in the title). 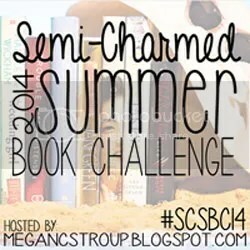 I have 7 categories left to go, one of which is read a book that another blogger has already read for the challenge. I’m looking forward to seeing what everyone else is reading and hopefully finding something amazing for this category! You can still join in with the challenge (and even count any books that you’ve read since 1st May retroactively). Click on over to Megan’s blog to find out what to do! I was really disappointed by A Long Way Down as well. That’s the only one I’ve read but I’ll keep the others in mind! I’m very impressed by how much you can read in a month! I haven’t read any of the books in your list so far. There are a few I think I like the sound of, but I daren’t get any more until I have finished what I have already! I believe it! I walk to work these days and get next to no reading done but when I had an hour-long bus ride I got through three books a week! So there are some benefits in commuting! My pile of books to read is getting bigger and bigger. I really need ca 6 more hours each day. 24 are too short. Haha, yes! Extra hours in the day would be useful. Oh you didn’t lie when you said you like to read! I’m still trying to reread The Hobbit which I started two months back! Good luck with the rest of the challenge (although I’m pretty sure you won’t need it!)! One of the other people taking part already has 115 points!